On the Sakura shinkansen from Kagoshima to Osaka, how do you find out which services have a green car ? All Sakura run between Kagoshima-Chuo and Shin-Osaka have Green car. Just some Sakura run between Kagoshima-Chuo and Hakata do not have it. If you search on Hyerdia, you will find it too. Do you know if this tentative schedule will carry over into april and may as well? Yes. It is not much different. domo arigato for the most useful link you have posted. I was able to download the entire schedules – just perfect. Please let us know once the question whether the JR Rail pass is valid on Mizuho and/or Sakura will be decided. I’ll let you know right after I’ll get info about Mizuho and Sakura. Thank you very much for all your work with the new schedules. I could only download and print the first (early morning) page with the schedules, but you are offering four (4) pages (Shin-Osaka departures after 8.45 AM and kagoshima-Chuo departures after 8.02 AM until the end of the day are all missing). Would you be so kind to email me the pdf file of the missing three pages ? Thank you in advance for your kind cooperation and all the best. Probably you accessed the timetable that I made. That is the sample for understanding the timetable in Japanese. Please try to access http://kyushushinkansen.com/cms/wp-content/uploads/2010/12/jikokuhyo.pdf. You will be able to see 4 pages. Hi JPRail, after watching the new schedule, I can notice that there is almost no kodama trains, will this service (and the 500 series) going to disappear then? 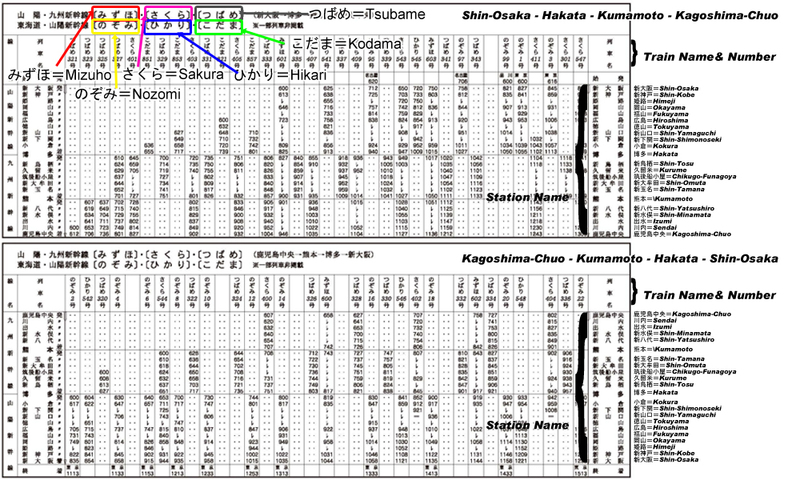 This timetable shows Kyushu Shinkansen trains and Sanyo Shinkansen trains that go through Kyushu Shinkansen or are connected with Kyushu Shinkansen trains at Hakata. We will still have Kodama (500 series too). But I’m not sure how many after Mar 12,2011.